Washington Capitals star Aleksandr Ovechkin has received the Kharlamov Trophy, which is awarded to the best Russian player in the NHL. Aleksandr the Gr8 has claimed the trophy, established by Sovetsky Sport newspaper, for the fourth year in a row. 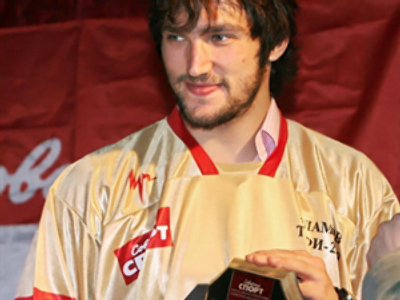 The winner was named after a vote by all Russians playing in the NHL, who chose the best among themselves. Pittsburg Penguins Evgeny Malkin and Detroit Red Wings Pavel Datsyuk, who are now battling it out for the Stanley Cup, were the runners up. Ovechkin led the Washington Capitals to the semi-finals of the NHL playoffs this year. He was the regular season’s best scorer with 56 goals, and added 11 more goals in the Stanley Cup. “On one hand, we certainly made a step forward compared to last year. On the other hand, the final result was a bit upsetting, considering our line-up we could do better. Now it’s not clear whether the backbone of the team remains. The ‘Washington’ Sergey Feodorov may leave and Viktor Kozlov may leave the team next season. It is unclear whether goalie Jose Theodore stays. The staff team was united and competitive and I am very sorry that our path in the play-off ended so early,” Aleksandr Ovechkin said commenting on the season to Russia’s Sport channel. The Kharlamov trophy, awarded since 2003, is named after legendary Soviet hockey player Valery Kharlamov, who never played in the NHL.